Slowly cooking the sofrito in plenty of oil gives this salad a deep, complex flavour that's freshened with a splash of sherry vinegar. Place the potatoes in a large saucepan and cover with cold water. Season well with salt. Bring to a simmer and cook for about 15 minutes until they can be pierced easily with a small, sharp knife. Drain well and allow to cool to room temperature. Heat a small frying pan over medium-low heat and add the olive oil, onion, garlic and capsicum. Cook, stirring regularly, for about 15 minutes until the mixture is softened and fragrant. Stir through the anchovies, parsley and vinegar. 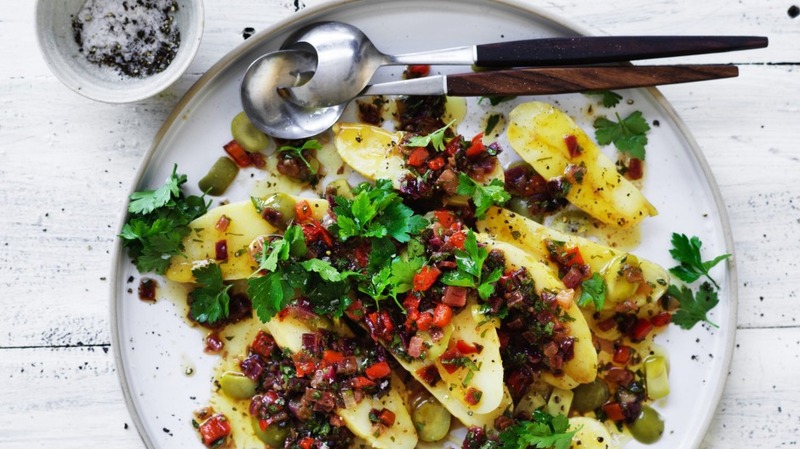 Thickly slice the potatoes and arrange them with the olives on a lipped serving plate. Pour over the dressing and stand for at least 5 minutes before serving. Adam's tip One of the real secrets to Spanish cooking is the sofrito. A base mixture of onions, garlic and capsicum (plus, sometimes, other ingredients such as tomato) cooks for a long time in olive oil to develop the aromatics and flavour the oil. If you like this recipe, see Adam Liaw's pan-fried John Dory.